With a rich heritage and a personal touch woven throughout their jewelry and branding, A. Jaffe pride themselves on their attention to detail and their craftsmanship. 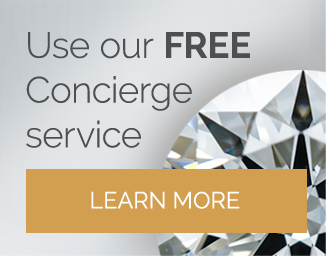 Their decades of experience have resulted in a strong reputation within the world of diamond jewelry, with more and more customers opting for the variety and individuality that A. Jaffe offers. I will be exploring the ins and outs of A. Jaffe to establish what this esteemed brand has to offer and whether or not their diamond jewelry is good value for money. Abraham Jaffe’s diamond jewelry dream took flight when he was just 26 years old; with a pioneering spirit, the young entrepreneur set up his first jewelry store on Maiden Lane in downtown New York City in 1892. He later moved to West 47th Street, anticipating the rush that would eventually flood this area of New York, setting it firmly at the centre of the international jewelry world. Jaffe patented the signature shape of the shank used in his engagement ring. The squared shank of the design was created to prevent the ring from twisting on the finger meaning that no matter how big the diamond, it would always sit central. This design is still used in A. Jaffe’s engagement rings 120 years on. A.Jaffe design bridal jewelry as well as stacking rings and customizable diamond jewelry. Their engagement ring collections include: Classic, Seasons of Love and Art Deco which feature solitaire, halo, side-stone, three stone and pave settings. Perhaps most distinctive of all jewelry collections is their Maps collection (more on this later). A.Jaffe jewelry is not available through the company’s website. They have specially selected retail partners to sell their creations, including Robbins Brothers and Since1910.com and Whiteflash. As well as the signature squared shank, A.Jaffe also offer rings with an engraved, quilted feature on the interior of the band. This prevents water and cosmetic products from being trapped beneath the ring and stops any irritation to the skin. 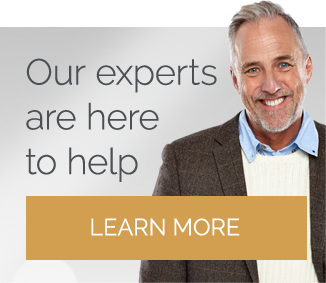 Furthermore, their gold is nickel free and contains a higher percentage of palladium than other brands, making their hypo-allergenic jewelry a great choice for those with sensitive skin. Their collection of engagement rings is delightfully varied and almost all styles are customisable to suit your centre stone and can be made using a precious metal of your choosing. A.Jaffe’s collection of diamond wedding bands is as impressive as their engagement rings with a huge variety of styles that vary from traditional to contemporary and unique. It appears A.Jaffe have thought of everything when it comes to choosing a diamond wedding band and this exceptional variety is certainly a result of their many established years within the world of bridal jewelry. Anticipating the rise in demand for personalised and custom-made jewelry, A.Jaffe created their Maps collection. This allows the buyer to select a meaningful location anywhere in the world, and have the map plot engraved into a disc of previous metal. The precise location that the customer holds dear is marked with a round brilliant diamond. The Maps collection once again demonstrates that A.Jaffe are on the ball when it comes to understanding the desires of consumers. Cufflinks, rings, dog tags and bracelets are also available in this collection. While other online stores may offer similar options for personalising jewelry, A.Jaffe executes the jewelry from their Maps collection with the same level of precious that they give their engagement rings, moving it from a gimmick, to a beautiful piece of sentimental jewelry. Across their website A.Jaffe place huge emphasis on the quality of their jewelry, and with good reason; it takes up to 80 hours to create a single ring, a breath of fresh air in a market saturated with generic pre-made mounts. The brand has ten quality check points offering assurance of the highest standards to their buyers. They use a longer casting process and add an extra burnishing stage when preparing the precious metal for their engagement rings and each diamond is individually set. No corners are cut during the creation of an A.Jaffe rings. The level of detail in their rings is exceptional, and the traditional by-hand methods give a quality finish and brilliant durability. It is a big statement, but I would go as far as to say A.Jaffe are in a league of their own when it comes to factors regarding time, precision and variety. They cannot be compared to the simplistic, easily reproduced mounts often sold in online jewelry stores. The price of their engagement rings sits comfortably within the mid-range of designer jewelry and is worth every penny. 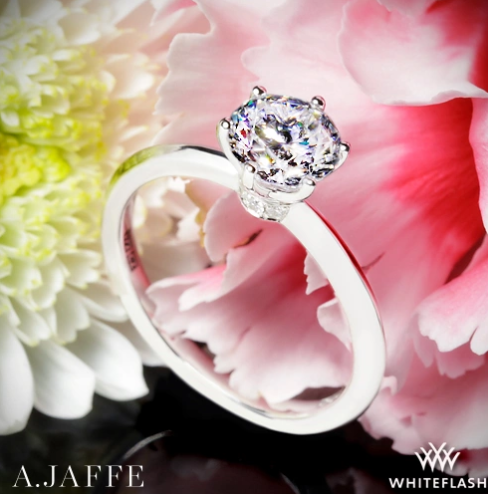 Not only do they sell A.Jaffe designs, but Whiteflash’s signature A CUT ABOVE® diamonds can be set in any A.Jaffe ring; these high performing diamonds reflect and compliment the exceptionally high standards of A.Jaffe’s engagement ring settings. In the ever changing world of diamond jewelry, A.Jaffe have adapted to the needs of the consumer, while remaining true to the philosophy that has successfully carried them through 120 years; high quality materials and expert craftsmanship are at the core of their business and they deliver this with every single ring. With engagement rings of this nature, it is imperative that they are partnered with an exceptional central stone, so as not to lose the sublime finish of the final ring. As suggested above, I recommend Whiteflash, as their A CUT ABOVE® diamonds are the best quality cut and have the best light performance and sparkle to do justice to an A.Jaffe setting and complete the engagement ring of your dreams. Are ASETS Issued as Standard with All Diamonds? 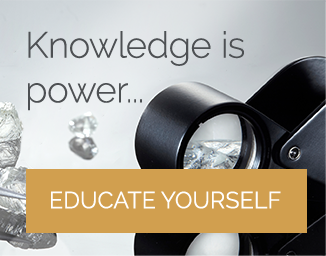 Cut quality and light performance are perhaps the most crucial elements to consider when assessing the beauty of a diamond. The Idealscope is a simple yet highly effective way to understand these elements and subsequently make better choices when buying a diamond. 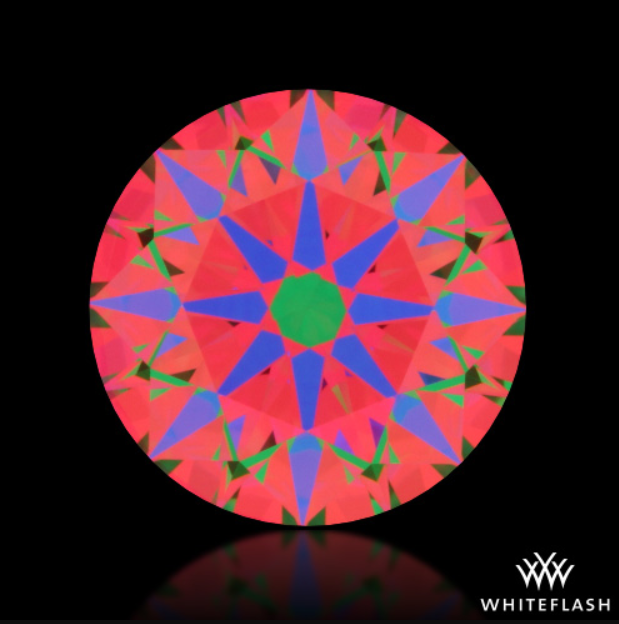 The Idealscope images can indicate areas of light leakage or asymmetrical cutting that are easily missed when viewing a diamond (particularly by the untrained eye). It is, therefore, extremely important that your chosen diamond vendor provides as much information about light performance as possible. Despite this, there are still many companies who do not provide these images, leaving buyers in the dark. Below is a table with some of the most popular diamond vendors, and the additional performance reports that are available with their diamonds.